Detroit engagement photography around the city provided by Kellie Saunders, a top Detroit wedding and engagement photographer. Kristen and Ryan are leaving Detroit soon. Now don't worry, it's not a sad move, it's a very good thing. Kristen is beginning her life as a Doctor in Houston and Ryan snagged a great engineering job there as well. When they hired me as their wedding photographer, they stressed how important it is to them to capture their love for each other along with their love for their city. They live right dab smack downtown and before they started packing up their lives for Houston, they spent an afternoon with me in the city that they love. We had a few hiccups and when I say a few - I mean a ton. You see, Detroit wedding and engagement photography isn't always easy. This spring and summer the entire city is pretty much under construction. Woodward is torn up for the rail project and orange barrels are everywhere else in the city. The beautiful grass that I so love in front of the old train station has been cut down to nothing and the Town Pump vinery on the front of the building is covered with scaffolding. To top it off, at the time of their session Belle Isle was being set up for the Grand Prix so there were grandstands and barrels everywhere! What started out as a one hour session turned into a four hour tour of the city. I have to tell you though, I had the absolute BEST time with these two! When I think of a couple who can roll with the punches I am thinking of Kristen and Ryan. It didn't matter how many orange barrels we ran into or how many locations were baracaded off - they just smiled and said - oh well - let's just have fun! And you know what - that's what we did. We ended up still hitting the main spots - but we just took a different view photographically speaking. I still shot awhere I normally do - but because of the obstacles I was forced to really think about the light and think about the connection between Kristen and Ryan. Because of that I think we were able to get a bit more artistic than I usually have time for. The construction slowed us down in a good way! Join me in congratulating Kristen and Ryan on their engagement and wishing them safe travels to Houston. I am so excited for their wedding next year! Detroit Engagement Pictures with Simona and Alex were taken by Kellie Saunders, a leading Southeast Michigan and Detroit wedding photographer. Detroit engagment photo locations included the Detroit Institute of Arts (DIA) and the Detroit Riverfront. Simona and Alex were nothing short of fantastic to work with. I enjoyed every minute of their fun and romantic filled engagement session in Detroit. Their romantic chemistry was off the charts as you can see in the photos. But don't let their sense of romance and connection to each other fool you, this couple always made time to smile, laugh and have some rowdy fun too! I thought they had almost the perfect balance together and I couldn't help but smile the whole time I was working with them. We started at the Detroit Institute of Arts (DIA) which is one of my favorite places to work. It offers a timeless, classic and clean look for an engagement session, and Simona and Alex wanted to rock out some formal wear so this was the perfect spot to do so. After we shot a bit at the DIA we headed over to a place in Downtown Detroit that I love which is shown below. The architecture is brilliant and Simona and Alex wanted to capture some of Detroit's essence in their photos. After that we ended our session on the riverfront which had the most perfect sunset waiting for us! I don't think it gets much better than this day! I will be sharing Simona and Alex's wedding photos soon, so stay tuned to see how gorgeous their wedding day was. Downtown Detroit Engagement Pictures with Genna and Justin were taken by Kellie Saunders, a leading Southeast Michigan and Detroit wedding photographer. Some of the locations included the Detroit Institute of Arts (DIA), Wayne State Campus and the Detroit Riverfront. I had a great time working with Genna and Justin to celebrate their engagement. Sometimes I meet people for the first time at the session, and this was the case with these two. We started out at the Detroit Institute of Arts (DIA) where we used some of the outside features to shoot with. We worked our way around the building and had such a great time laughing and getting to know each other. Genna wanted to have some uniquely Detroit images, so we headed over to Wayne State campus where they have a blue viduct that is actually used as an art piece on Cass Avenue. I believe people actually call it the Cass Avenue Viaduct. I am pleased to say no one was hurt during the taking of their engagement photos at the Cass Avenue Viaduct, although I did dodge a few cars. Our fun didn't end there. Justin said he wanted to get a shot of the best view of the city, so that's just what we did next. We headed over to the Detroit Riverfront where we climbed a small hill to get a great shot of the Ren Cen and city in the background as the sun set. It was the perfect ending to the perfect engagement session. What a fun time we had! I'll be sharing their Planterra wedding photos soon, so keep a look for my post. Congratulations Justin and Genna! You both rock and I'm so happy you picked me to work with you! I am the lucky one! 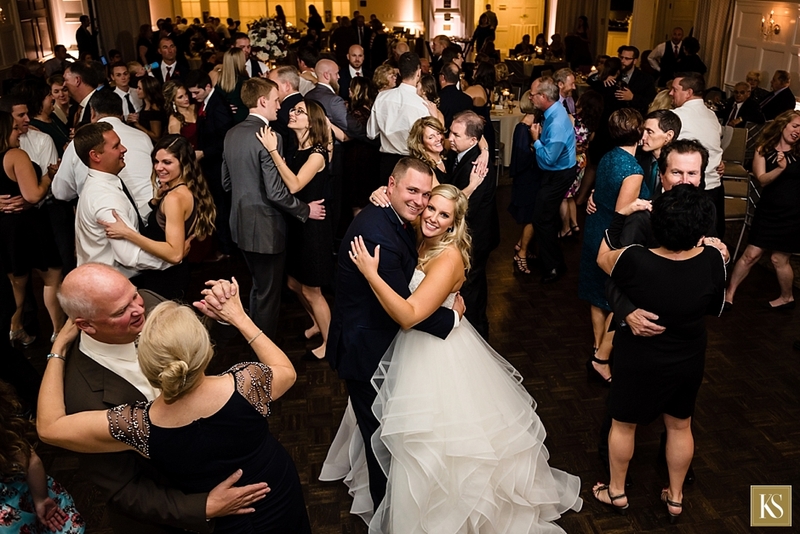 Southeast Michigan wedding photography in Birmingham, MI at The Birmingham Community House and Academy of the Sacred Heart Catholic Church in Bloomfield Hills provided by Kellie and Jen, two favorite Southeast Michigan wedding photographers. This has to be my favorite rainy day wedding of all time! It actually rarely rains all day long on a wedding day. Often the rain stops for a short time and we can go outside for a few quick moments to create bridal party portraits and of course portraits with our couple alone. However on this day, mother nature had other plans for us. Michigan decided that it was going to rain and rain and then rain some more. Even futher, to top it off, mother nature said, "Hey wedding people - I think I'm going to rain like really, really hard!" So needless to say, we had to work with what we had to work with on this day. We were blessed to be able to work with Amanda and Corey because they really knew how to just go with the flow and enjoy the heck out of their day, feeling every single moment and more importantly, living and experiencing each moment. What makes your wedding day come to life is actually living the moments and taking them in, each one as it comes. Amanda and Corey are not strangers to exceptional moments though. Their proposal story is one fantastic moment. They met in high school through a friend. They dated for 8 years filled with fun memories and experiences. Corey didn't know how he could top the last eight years, but somehow he managed to propose in the most romantic and picturesque way. Using the backdrop of wild horses and the ocean, his proposal couldn't have been more perfect as he decided to ask Amanda to marry him on the Outer Banks in North Carolina. Of course Amanda said YES, and I'm so happy that she did because I was able to work with an exceptional couple and meet all their friends and family and learn what exactly makes them so special. Regardless of the rain on their wedding day, Amanda and Corey were prepared for a fantastic day and fantastic is just what happened. Thanks to the infamous "uncle pizza" (well that's my nick name for him), Amanda had quite the luxurious home to prepare for her wedding in. Amanda did a reveal on her wedding day to her bridesmaids and shortly thereafter we headed over to Sacred Heart church in Bloomfield Hills so she could meet Corey at the alter. Corey, breathed each moment in and when he saw Amanda for the first time, it's one of my favorite groom captures of all time. His face is filled with love and I couldn't help but smile. We took what photos we could inside the church, and because of the rain made our way to the Birmingham Community House and used the inside for portraits as well. The Birmingham Community House is such a beautiful wedding venue. The location is perfect as it's right downtown and there's a park across the street along with other little nooks and interesting places we can use for wedding portraits. We had a great time photographing the wedding inside the Birmingham Community House, but I had an even better time later. Lucky for me, after dinner before dancing began Corey and Amanda decided they were up for adventure and wanted to head outside and dance in the rain for a few moments. If you know me at all you know I was more than happy about this request! You can see the results below, but what fun we had! Please join me in congratulating Amanda and Corey as they begin their lives together! They told me they plan on moving to the Outer Banks one day as they both love the warm weather. I hope that happens for them and I wish them all the love and happiness in the world! Winter Engagement Pictures in Birmingham, Michigan with Cameron and Erinn were taken by Kellie Saunders, one of Michigan's favorite wedding photographers. 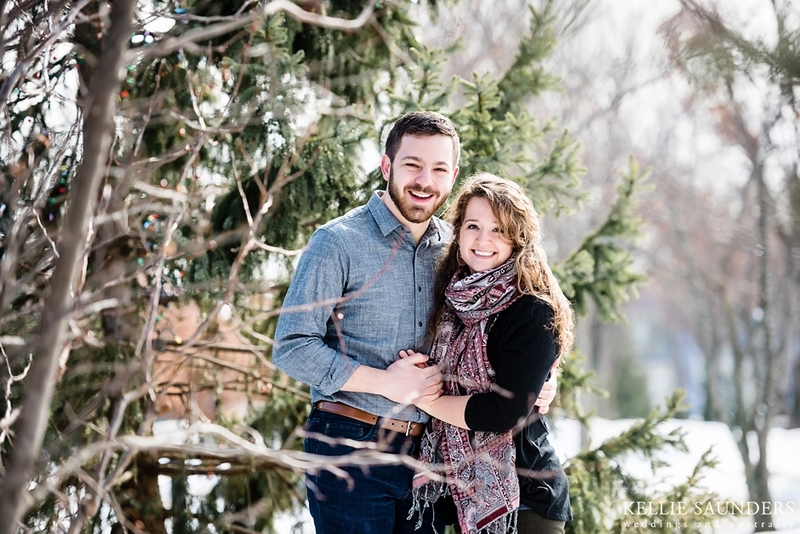 Locations used for these winter engagment pictures in Michigan were Quarton Lake and Shain Park in Birmingham. Today is March 11. As much as I wish winter was over, I know we still have a few weeks left of it. So I wanted to warm my day a bit by sharing one of my all time favorite couples winter engagement session. Erinn and Cameron are loving, lively and fun. What a great time we had battling the weather and celebrating their engagement. They visited my studio in Birmingham and we just spend a little time in a local park and downtown, and I was able to witness a few moments that were definitely worth capturing. I rarely shoot engagement sessions in the winter because it's difficult to find a day that actually cooperates weather wise. It's either really super cold, or windy or the hail or freezing rain cometh down. Lucky for all of us the day of Erinn and Cameron's engagement session the weather was smiling down on us. Yes, it was cold, I cannot tell a lie, but we found some sparkling snow and made our own little oasis of fun! 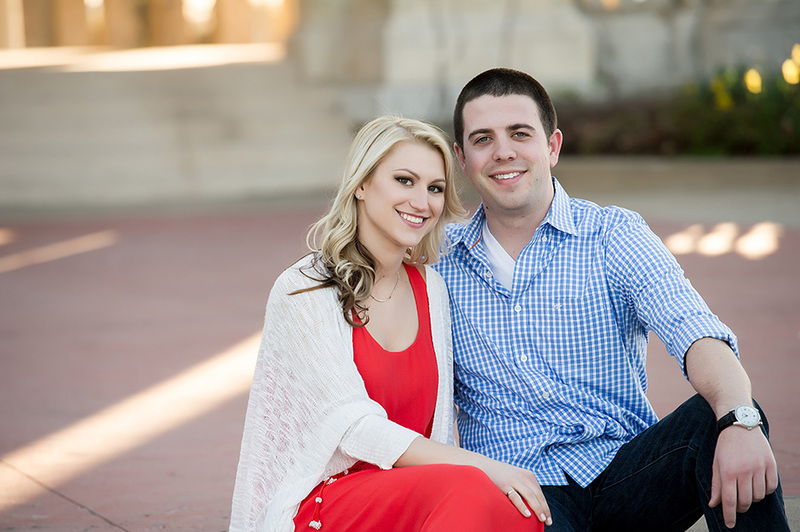 My favorite part of their session was when we hit the downtown area at Shain park. We were able to use the trees to frame them perfectly and I just adore the images! Please join me in saying congratulations Erinn and Cameron!